A while ago, I used to work in Sunderland. I passed by the Winter Gardens every now and again, and once had a tour around for my job. Back then, I was too busy to realise what wonders the museum held, and we just had a little look in at the garden. So a wet and windy day had me going back to see what it’s like now. The ground floor rooms are full of interesting, amazing, curiosities. There doesn’t seem to be a link between the items on display (there probably is), but each thing is fascinating to look at. There are pocket watches, a car, a few lions and this diver suit. James had more fun playing dress up! There are a few ‘boy costumes’ and a few for girls. I think the girls could wear either, but the boys can’t really get away with the dresses and flowery caps. That’s sad, I think, because boys like dress up too, and we had to wait while a girl wore the top hat and coat. Something for them to think about, perhaps. 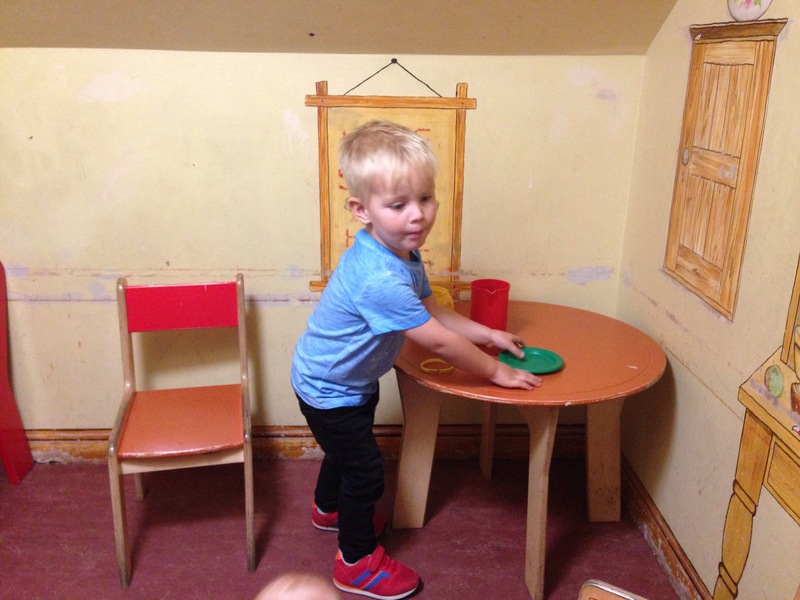 There’s a textile room which we enjoyed wandering around, mostly because you can touch the various fabrics, and that’s a nice sensory thing for Noah! 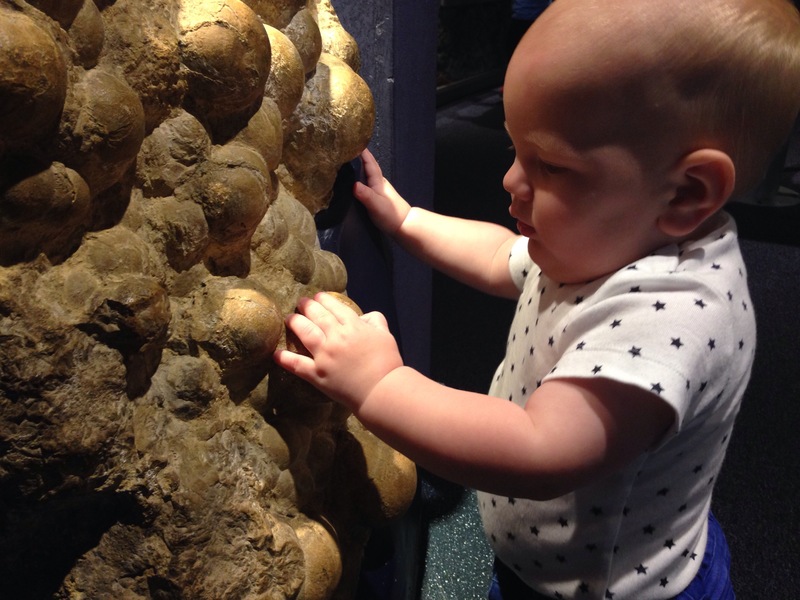 He really liked these rocks in the Geology section upstairs. I’m afraid to say that a few were tasted! He’s fine, and I don’t think the rocks were hurt by that experience! Also upstairs is a brilliant collection of glass from Sunderland (the National Glass Centre is just down the road), a collection of stuffed animals, and an exhibition about life in Sunderland through the centuries. And there’s the adorable little house, which is literally just a hole in the wall. They need more tea set items, so if you’re nearby, have some you’re going to throw away, and passing – do drop them off! I had to drink my ‘tea’ out of a jug, and what’s that teaching our youngsters about the world?! We had our real lunch in the restaurant. I ordered a ham sandwich for James, and a bacon and brie ciabatta for me. James’ sandwich was full of ham, and when he’d had a good go at it, but still left some, I can tell you I really regretted not having a spare Tupperware box with us. 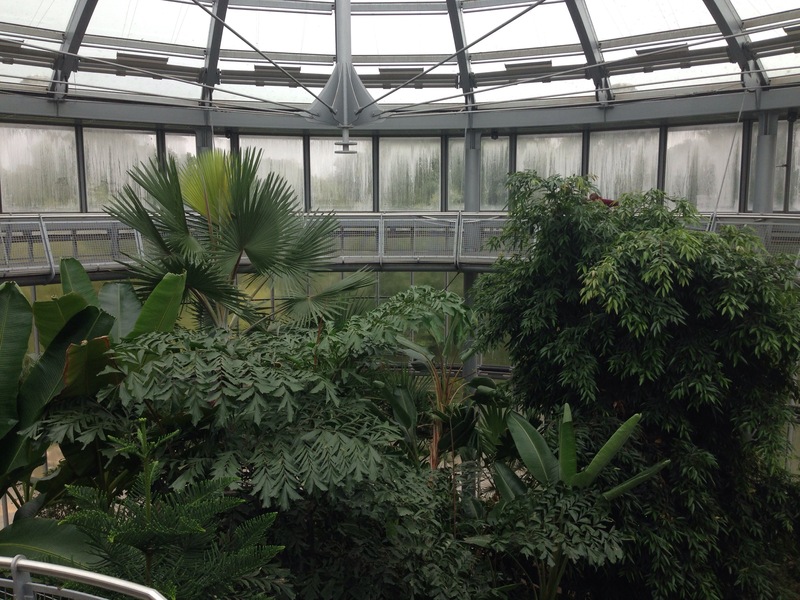 When we visited Sunderland Winter Garden, the dinosaurs were exploring the gardens, too! All in all, this was a brilliant day out for us. We parked just up the hill from the museum, and secure covered parking cost 90p per hour, which isn’t too bad. There’s a lovely looking park right next to the museum (look out for the walrus!) so if the weather is kind, you could take a picnic. There’s lots to see and do; I’ve just touched on the exhibits in this post, and best of all, the Sunderland Winter Gardens Museum is free! Have you ever visited a Winter Garden? I love how kid-friendly Sunderland is! I will have to take my kids one day if we are ever in the area! Sunderland looks like an awesome trip. Looks like the perfect kid-friendly spot! Seems like you guys had a great day! Looks like a wonderful time. That sensory room mustve been amazing for the little one!!! Wow It looks like you had a great time. Sunderland sounds like a great place for families. My kids will love it there. This looks like a fun place to visit with the family. We have a children’s museum in East Texas that is similar to this, but there’s not much outside to it. I always love museums which hold activities to engage the kids and edify the adults. Reading this reminds me it has been a while since we visited our local museum with the boys. It looks like so much fun! Um, that “what could you get for your money” thing had me crying haha! Looks like a really unique place to visit–we love checking out new museums wherever we go! That sounds like so much fun! (And I’m with your son, I love touching all the fabrics, too!) We don’t have any Winter Gardens down here (not really a need as it’s near tropical year-round) but the indoor exhibits remind me of our local Museum of History with the interactive exhibits, the play house (ours is called Grandma’s Attic), and the timelines. I have never been to Sunderland before but it looks like you had a lot of fun I am glad that you enjoyed it. Oh wow! What a fun place to visit! I love the Dive Suit! This is so cool! Your pictures are great and it looks like you all had a wonderful time! looks like they had a blast. Love visiting the museum, thanks for sharing. This place looks so fun! I wish we were close enough to give it a go, my little family would absolutely love it! Looks like a fun – I especially love the dinos! Looks like a fun place! Seems you all had a good time.